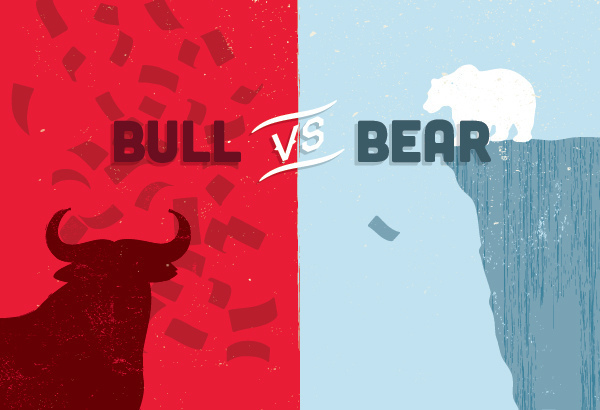 In any market, the general condition is either described as bearish or bullish, depending on whether the prices of securities rise or fall over a certain period of time. Market conditions are either brought about by changes in economic activities, investor attitudes, and even government actions. These market conditions either lead to a bear or bull market. A bull market occurs when the GDP of a country is rising and the economy is very smooth. In this scenario, the prices of securities rise continuously due to improved internal circumstances of the sector. In bull markets, the investors have positive expectations of investments made and are confident enough of the state of the economy. Bull markets have four phases. Recovery from the pessimistic situation that occurred after the bear market situation. In this stage, the prices falls and the investor confidence is low. Trading activities pick up and the stock prices start rising. Stock price per equity ratios rise. The IPO activities at this stage are also many. It should be noted that bull markets do not last for long. This is irrespective of the fact that these markets present enough chances to easily increase investments and also make more money. Investors must, therefore, be keen enough when entering these markets so as to maximize their investments. A bear market is a situation whereby there is a declining trend in the market over a period of time. This means that the prices of assets are either already declining or are expected to decline in the immediate future. Such a situation costs investors a lot of money. Investor confidence also declines. Securities prices are very high hence the investors sell, gaining maximum profits and exiting the market. 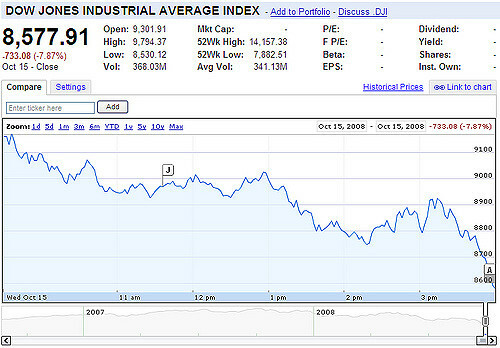 Stock prices rapidly fall, creating a pessimistic confidence in the investors which can create a panic situation. Dividend yields also go up, which is an indication that a lot of money needs to be pumped into the system. Speculators join the market and trading volumes and price continue to rise. The prices of stock further fall, but at a slower pace. This creates a positive reaction hence giving way for the bullish outlook to re-enter. An indicator like gross domestic product in both markets plays an essential role in showing how the economy is performing. Both markets greatly influence economic growth, either positively or negatively. A bull market takes place when the economy is performing well. A bear market on the other hand takes place when the economy is not performing well. In a bull market, investors tend to take long positions in the market due to an optimistic attitude. In this case, investors expect security prices to rise further hence maximizing opportunities. In a bear market, however, the market attitude is pessimistic; hence investors take a short position. Investors here undertake a put position with an expectation of a falling market. In a bull market, the economy is sustainable while in a bear market the economy does not grow as fast or even falls. The economy in a bear market is characterized by low unemployment, declining business profits, less disposable income not to mention unpredictable changes in tax rates. Market indicators, which are used for forecasting market trends, tend to be very strong in a bull market. In a bear market, however, the market indicators are not strong. In a bull market, a lot of income is in the hands of the public, hence making it easily disposable. In a bear market, however, there is less income available to the public; hence the amount of disposable income is less. The liquidity in a bull market is very high as there is increased trading activity hence investors continue to pump more funds. In a bear market, however, investors are reluctant to trade hence the liquidity is very low. A bull market encourages international investments while a bear market discourages international investments. Due to the financial strength, an investor can receive in a bull market, the earning on dividends and securities tend to be low. A bear market, however tends to lure investors by offering higher dividends and securities yields. The condition of the market is determined by macroeconomic situations and large-scale factors. Investor sentiments also play an important role in determining the state of the markets. Despite the fact it is impossible to avoid market changes, an investment decision should be fully thought and a lot of patience has to be practiced in investments decisions. Tabitha Njogu. "Differences Between Bear Market and Bull Market." DifferenceBetween.net. 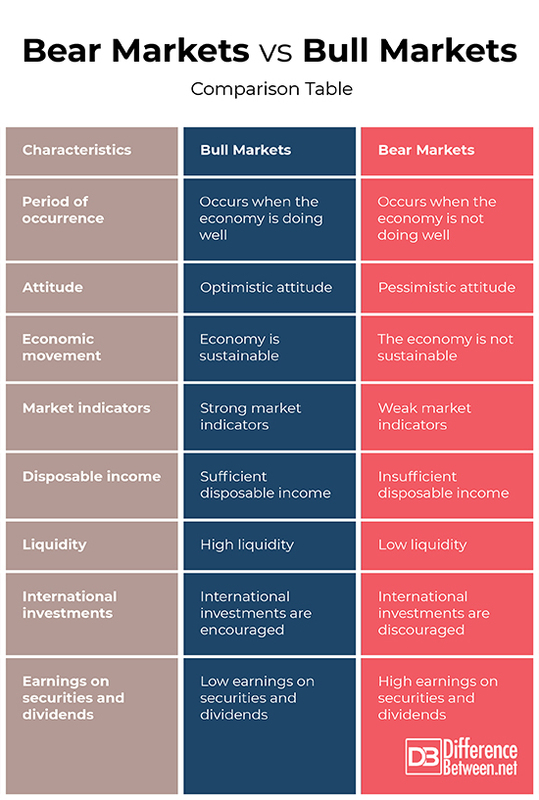 January 9, 2019 < http://www.differencebetween.net/business/investment-business/differences-between-bear-market-and-bull-market/ >.